Our inventory currently contains 5134 matches against your search criteria. VF+ $13 Make An Offer! VF/NM $18 Make An Offer! writing BC G $65 Make An Offer! Offwhite pages CGC 9.6 NM+ $75 Make An Offer! Offwhite/white pages, small stain and some foxing back cover VF $20 Make An Offer! White pages CGC 8.5 VF+ $65 Make An Offer! White pages, Death cover/story, regular edition CGC 9.6 NM+ $150 Make An Offer! White pages, 1992 issue NM+ $25 Make An Offer! QUALIFIED- COVER DETACHED, White pages CGC 9.8 NM/M $100 Make An Offer! Winnipeg $75 Make An Offer! Offwhite/white pages CGC 9.4 NM $50 Make An Offer! Winnipeg $50 Make An Offer! Offwhite pages CGC 9.2 NM- $35 Make An Offer! Offwhite/white pages, 200-3 written on front cover in pen F+ $36 Make An Offer! Offwhite/white pages, water stains VG+ $15 Make An Offer! Offwhite pages VG/F $8 Make An Offer! Offwhite pages, small 4-7 written on front cover in pen VF+ $20 Make An Offer! Offwhite pages F/VF $10 Make An Offer! Original owner collection, offwhite pages VF $9 Make An Offer! Original owner collection, offwhite/white pages VF $9 Make An Offer! Original owner collection, offwhite/white pages VF+ $9 Make An Offer! Offwhite pages VG/F $5 Make An Offer! Original owner collection, offwhite/white pages F+ $4 Make An Offer! Offwhite/white pages VF/NM $11 Make An Offer! Offwhite pages VG/F $3 Make An Offer! Original owner collection, offwhite/white pages F $3 Make An Offer! Offwhite pages, light subscription crease through front cover F $3 Make An Offer! Offwhite pages, light subscription through front cover F $3 Make An Offer! Offwhite pages, DEC 5 stamped on front cover F $3 Make An Offer! Offwhite pages, Neal adams intereior VF $16 Make An Offer! Offwhite/white pages, subscription crease VG+ $7 Make An Offer! Cream/offwhite pages, cover detached, small I written on front cover Fr $35 Make An Offer! Cream/offwhite pages, small I written on top of front cover G $60 Make An Offer! Cream/offwhite pages, Small I written on front cover in grease pencil G+ $60 Make An Offer! Offwhite pages, small 2 written on front cover VG $100 Make An Offer! Cream/offwhite pages, 2' top spine split G- $40 Make An Offer! Cream/offwhite pages, small R written on front cover G $50 Make An Offer! Cream/offwhite pages, 4 inch long by 2 ' wide piece of back cover corner G- $30 Make An Offer! Cream/offwhite pages, small R written on front cover G+ $50 Make An Offer! Cream/offwhite pages, R-8-31 written on front cover, 1 inch tear top front cover VG $75 Make An Offer! Cream/offwhite pages, Dorothy written on top of splash page Fr/G $20 Make An Offer! Cream/offwhite pages, small R writtn on front cover, small piece of tape on 2' bottom tear back cover G- $30 Make An Offer! Cream/offwhite pages, 2 inch top spine split, small R written on top of front cover G- $30 Make An Offer! Cream/offwhite pages, cover detached Fr $10 Make An Offer! Cream/offwhite pages VG+ $80 Make An Offer! Cream/offwhite pages, small R written on top of front cover VG+ $80 Make An Offer! Cream/offwhite pages G $32 Make An Offer! Offwhite pages VG+ $165 Make An Offer! White pages, C9/131 written on front cover CGC 8.0 VF $200 Make An Offer! White pages, C1/24 written on front cover VF+ $210 Make An Offer! Offwhite pages VF/NM $360 Make An Offer! White pages, C3/21 written on front cover VF $120 Make An Offer! White pages CGC 8.5 VF+ $135 Make An Offer! Offwhite pages F+ $42 Make An Offer! White pages, C11/2C written on front cover CGC 9.0 VF/NM $200 Make An Offer! White pages, C1/22 written on front cover, cover detached from bottom staple VG/F $25 Make An Offer! White pages, C3/13 written on front cover, cover detached from bottom staple VG+ $20 Make An Offer! White pages, C7/24 written on front cover VF/NM $155 Make An Offer! White pages, C9/25 written on front cover CGC 9.0 VF/NM $150 Make An Offer! White pages NM- $175 Make An Offer! Offwhite pages, tiny 11 26 written on front cover in pen VG+ $20 Make An Offer! White pages, tears along top/bottom of back cover F/VF $40 Make An Offer! White pages, staples have light rust VF+ $90 Make An Offer! White pages VF $55 Make An Offer! Offwhite pages, tiny 5 20 written on front cover in pen VG+ $20 Make An Offer! White pages, C7/22 written on front cover, Robot cover CGC 9.2 NM- $175 Make An Offer! White pages, cover detached from top staple VG/F $20 Make An Offer! Offwhite pages, tiny 1 19 written on front cover in pen F/VF $28 Make An Offer! offwhite pages CGC 9.2 NM- $130 Make An Offer! Offwhite pages, subscription crease on back cover F- $18 Make An Offer! Offwhite pages F+ $22 Make An Offer! G $50 Make An Offer! White pages CGC 9.9 Mint $800 Make An Offer! Offwhite pages, P8-17 written on front cover in pen, cover detached fronm top staple VG $12 Make An Offer! NM- $48 Make An Offer! VF/NM $50 Make An Offer! Offwhite/white pages CGC 8.5 VF+ $50 Make An Offer! VF/VF+ $395 Make An Offer! Original owner collection, offwhite pages F+ $18 Make An Offer! Original owner collection, offwhite pages VF/VF+ $20 Make An Offer! NM-/NM $28 Make An Offer! Original owner collection, offwhite pages, nice copy NM- $30 Make An Offer! NM-/NM $40 Make An Offer! Original owner collection, offwhite pages VF $18 Make An Offer! VG $3 Make An Offer! Glossy and rich colors, offwhite pages VF- $15 Make An Offer! Original owner collection, offwhite pages VF- $15 Make An Offer! offwhite pages VF-/VF $16 Make An Offer! F/F+ $5 Make An Offer! White pages, C6/14 written on front cover G+ $65 Make An Offer! Offwhite pages, 2-1-69 written on back cover in pen F/VF $30 Make An Offer! Sweet copy, offwhite/white pages NM-/NM $60 Make An Offer! Sweet copy, offwhite pages NM-/NM $60 Make An Offer! Offwhite pages, black cover VF/NM $45 Make An Offer! White pages VG $6 Make An Offer! F $4 Make An Offer! 1' spine tear, offwhite pages F- $5 Make An Offer! Offwhite pages, 35 written in pencil on back cover VF+ $70 Make An Offer! Offwhite/White pages, 3 small stains top of back cover VF+ $60 Make An Offer! Offwhite/white pages, sweet copy NM $75 Make An Offer! cream/offwhite pages, great cover NM- $42 Make An Offer! Offwhite pages, sweet copy NM $40 Make An Offer! Cool cover, offwhite pages, sweet copy NM $32 Make An Offer! Awesome purple inks and cover NM- $35 Make An Offer! Offwhite pages, cool werewolf cover NM $40 Make An Offer! Killer copy, rich colors, offwhite pages NM-/NM $32 Make An Offer! Sweet copy, offwhite pages NM $28 Make An Offer! offwhite to white pages CGC 9.4 NM $50 Make An Offer! cream to offwhite pages NM- $25 Make An Offer! Get me some of that Demon Rum, offwhite pages VF+ $8 Make An Offer! White pages, sweet CGC 9.6 NM+ $60 Make An Offer! offwhite pages CGC 9.4 NM $35 Make An Offer! offwhite to white pages CGC 9.2 NM- $30 Make An Offer! offwhite to white pages CGC 9.6 NM+ $65 Make An Offer! offwhite pages, Frankenstein cover, sweet copy NM/NM+ $35 Make An Offer! cream to offwhite pages CGC 9.6 NM+ $40 Make An Offer! offwhite to white pages CGC 9.4 NM $45 Make An Offer! offwhite pages, sweet copy NM/NM+ $35 Make An Offer! Offwhite/white pages, sweet copy NM+ $25 Make An Offer! offwhite pages NM $14 Make An Offer! Awesome Skulls cover, offwhite pages CGC 9.4 NM $35 Make An Offer! I love this cover! cream to offwhite pages NM-/NM $25 Make An Offer! Don Rosa $10 Make An Offer! offwhite pages, Dig the Plant Man! CGC 9.4 NM $35 Make An Offer! Don Rosa $7 Make An Offer! Cream/offwhite pages CGC 9.6 NM+ $40 Make An Offer! offwhite to white pages CGC 9.4 NM $40 Make An Offer! Last issue, white cover, offwhite/white pages NM+ $30 Make An Offer! White cover, sweet copy, offwhite pages NM/NM+ $21 Make An Offer! last issue of series, Wild cover of Witches! offwhite/white pages CGC 9.4 NM $50 Make An Offer! White pages, 1 inch top spine split, last issue VG+ $8 Make An Offer! M. jeweler insert, offwhite pages VF/NM $50 Make An Offer! Offwhite pages, distributor stain top back cover NM- $65 Make An Offer! Offwhite pages, Great cover VF/NM $50 Make An Offer! Offwhite pages, cool cover VF/NM $50 Make An Offer! rich colors, offwhite pages VF- $18 Make An Offer! Offwhite pages NM-/NM $30 Make An Offer! Offwhite pages CGC 9.0 VF/NM $25 Make An Offer! Rich colors, sweet copy, offwhite/white pages CGC 7.5 VF- $25 Make An Offer! Rich colors, offwhite/white pages VF+ $18 Make An Offer! Rich colors, offwhite pages VF+ $16 Make An Offer! Offwhite pages, deep rich colors VF/NM $25 Make An Offer! Offwhite pages, JAN 30 B stamped on back cover VF- $12 Make An Offer! Offwhite pages, 3 inch piece of tape on inside front cover G $175 Make An Offer! White pages, variant cover NM+ $5 Make An Offer! Offwhite pages, small 53-54 written on front cover in pen F+ $200 Make An Offer! Offwhite/white pages F $125 Make An Offer! Offwhite pages VG+ $75 Make An Offer! Offwhite pages, water stain back cover VG $28 Make An Offer! Cream/offwhite pages, water stain bottom back cover G $12 Make An Offer! White pages CBCS 5.5 F- $1,375 Make An Offer! White pages F $200 Make An Offer! Cream/offwhite pages VG $100 Make An Offer! White pages F $90 Make An Offer! Offwhite pages F $75 Make An Offer! Offwhite/white pages, NOV 7 1963 stamped on front cover F/VF $160 Make An Offer! Offwhite pages, foxing front/back cover F+ $60 Make An Offer! Offwhite pages F $42 Make An Offer! Cream/offwhite pages VG+ $36 Make An Offer! Offwhite pages VG $25 Make An Offer! Offwhite pages, foxing inside front cover F+ $60 Make An Offer! Cream/offwhite pages VG- $24 Make An Offer! Cream/offwhite pages, cover detached from bottom staple, complete G- $10 Make An Offer! Cream/offwhite pages F- $36 Make An Offer! Offwhite/White pages F/VF $80 Make An Offer! Offwhite pages, color touched amateur on spine F $14 Make An Offer! Cream/offwhite pages F $24 Make An Offer! Offwhite pages, AUG 13 stamped on front cover F- $24 Make An Offer! Offwhite/white pages CGC 8.5 VF+ $625 Make An Offer! Offwhite/White pages F/VF $225 Make An Offer! Cream/offwhite pages F- $20 Make An Offer! offwhite apges VG $14 Make An Offer! Offwhite pages, complete G- $5 Make An Offer! White pages CGC 9.0 VF/NM $180 Make An Offer! Offwhite/white pages, small r/10 written on front cover in pen VF- $50 Make An Offer! Cream/offwhite pages VG $18 Make An Offer! Cream/offwhite pages, tiny 1 12 written on front cover in pen VG+ $20 Make An Offer! Offwhite pages F+ $32 Make An Offer! Cream/offwhite pages20 F $24 Make An Offer! Rich colors, offwhite pages, nice copy VF/VF+ $50 Make An Offer! White pages, C8/111 written on front cover VF- $35 Make An Offer! GL NM- $45 Make An Offer! White pages, 3 pre-marvel chips along right edge of front cover VF+ $70 Make An Offer! White pages NM- $105 Make An Offer! Cream/offwhite pages VG+ $15 Make An Offer! White pages, C2/9/ written on front cover NM-/NM $140 Make An Offer! 15 cent sticker on fc, book would be NM without it. Offwhite pages F $20 Make An Offer! White pages, C3/91 written on front cover NM $150 Make An Offer! White pages NM- $65 Make An Offer! Offwhite pages, Name/address stamped on back cover VG+ $10 Make An Offer! Offwhite pages, 2 Ohio 25 cent store stickers on back cover F $12 Make An Offer! offwhite pages, rich colors F+ $16 Make An Offer! Offwhite/white pages, subscription crease VG+ $10 Make An Offer! White pages, C9/13 written on front cover NM $85 Make An Offer! Rich colors, offwhite pages F+ $16 Make An Offer! Deep rich purples, offwhite pages VF/VF+ $28 Make An Offer! Offwhite pages, small X written on front cover in grease pencil F- $10 Make An Offer! offwhite/white pages VF-/VF $20 Make An Offer! offwhite pages, rich colors F $20 Make An Offer! Rocky Mountain $450 Make An Offer! Offwhite pages, centerfold detached from top staple F- $10 Make An Offer! one page has a 1/2' tear, offwhite pages, nice copy VF+ $28 Make An Offer! Great fc, however large stain on back cover that goes into 4-5 pages of book G $4 Make An Offer! White pages NM-/NM $75 Make An Offer! Deep rich colors, offwhite/white pages F+ $16 Make An Offer! Offwhite pages, 4' spine split, complete Fr/G $2 Make An Offer! Offwhite pages, nice colors, nice copy VF/VF+ $28 Make An Offer! Sweet copy, offwhite/white pages VF+ $30 Make An Offer! offwhite pages VF $23 Make An Offer! Offwhite pages, rich colors, nice copy NM $75 Make An Offer! Cream/offwhite pages G $4 Make An Offer! 12 2 67 written on top of splash page, offwhite pages F $10 Make An Offer! offwhite pages, nice copy VF/NM $28 Make An Offer! offwhite pages, APR 8 neatly stamped on fc F+ $13 Make An Offer! Offwhite pages, light subscription crease VG+ $8 Make An Offer! Offwhite pages CGC 9.0 VF/NM $40 Make An Offer! Deep rich inks, offwhite/white pages F+ $13 Make An Offer! 5 23 68 neatly written on top of splash page, offwhite pages, deep rich colors F $10 Make An Offer! Deep rich colors, offwhite/white pages F+ $13 Make An Offer! Offwhite pages, subscription crease VG $6 Make An Offer! DEC 29 1969 stamped on front cover, offwhite/white pages, JAN 10 1970 stamped on splash page VF+ $32 Make An Offer! offwhite/white pages, rich colors VF+ $18 Make An Offer! Offwhite pages NM- $34 Make An Offer! Cream/offwhite pages VF $13 Make An Offer! Cream/Offwhite pages CGC 9.0 VF/NM $35 Make An Offer! Offwhite pages VF $13 Make An Offer! Cream/offwhite pages VF- $11 Make An Offer! Offwhite pages, picture frame marvel F- $5 Make An Offer! Offwhite/white pages, picture frame marvel NM $38 Make An Offer! Cream/offwhite pages, picture frame marvel F+ $7 Make An Offer! Offwhite pages, small 11-3 written on back cover in pen, picture frame marvel F $6 Make An Offer! Offwhite/white pages CGC 9.6 NM+ $100 Make An Offer! Offwhite pages, picture frame marvel, Distributor spray top edge of front cover NM $40 Make An Offer! Offwhite pages, picture frame marvel VF- $9 Make An Offer! OffWhite pages, picture frame marvel CGC 9.4 NM $100 Make An Offer! Cream/offwhite pages, picture frame marvel VF- $9 Make An Offer! Cream/offwhite pages, picture frame marvel F $6 Make An Offer! Offwhite pages, picture frame marvel G+ $4 Make An Offer! Offwhite pages, picture frame marvel VF $9 Make An Offer! Offwhite pages, picture frame marvel VF/NM $18 Make An Offer! White pages, Hitler cover VF- $10 Make An Offer! Offwhite pages, Hitler cover, Picture frame marvel VF- $8 Make An Offer! Offwhite pages, Hitler cover F- $6 Make An Offer! Cream/offwhite pages VG+ $5 Make An Offer! White pages, sweet copy NM $475 Make An Offer! White pages C7/7/ written on front cover VF $90 Make An Offer! VF- $85 Make An Offer! Offwhite pages VG/F $35 Make An Offer! Offwhite pages VG+ $35 Make An Offer! White pages, crease through entire front cover F $18 Make An Offer! Offwhite pages VF/NM $38 Make An Offer! Offwhite pages, tiny 30 written on splash page in pencil NM-/NM $25 Make An Offer! Sweet copy, offwhite pages NM $20 Make An Offer! Sweet copy, offwhite pages NM $14 Make An Offer! offwhite pages F/VF $3 Make An Offer! Offwhite pages G/VG $45 Make An Offer! Cream/offwhite pages Pr $5 Make An Offer! Offwhite/white pages NM- $35 Make An Offer! 1/4' tear in bc, offwhite pages F $6 Make An Offer! Nice copy, offwhite pages NM $10 Make An Offer! White pages NM $140 Make An Offer! offwhite pages NM-/NM $65 Make An Offer! Offwhite pages VF/NM $48 Make An Offer! White pages, JUL 17 stamped on back cover VF+ $60 Make An Offer! Offwhite pages VF $39 Make An Offer! White pages NM $65 Make An Offer! offwhite pages NM $36 Make An Offer! Original owner collection, cream/offwhite pages VF $16 Make An Offer! Kaluta/Wrightson, offwhite pages NM $50 Make An Offer! White pages VF+ $35 Make An Offer! Kaluta/Wrightson, offwhite pages VF $18 Make An Offer! Original owner collection, cream/offwhite pages F+ $12 Make An Offer! Offwhite pages F+ $11 Make An Offer! White pages G+ $4 Make An Offer! White pages, date stamp on back cover NM $32 Make An Offer! Offwhite pages, 5' tear in front cover Fr/G $2 Make An Offer! White pages, AUG 1 stamped on back cover NM- $25 Make An Offer! White pages, NOV 21 stamped on back cover NM $32 Make An Offer! White pages, MAR 25 stamped on back cover VF/NM $20 Make An Offer! Offwhite pages, cool cover, tiny bit of bug chew on back cover F $275 Make An Offer! Offwhite/white pages, small Av 1/30 written on front cover in pencil VF-/VF $285 Make An Offer! CGC 8.5 VF+ $385 Make An Offer! Offwhite/white pages, nice copy VF/NM $18 Make An Offer! Offwhite/white pages VG $8 Make An Offer! Very nice copy, back cover wraps into fc a bit, offwhite/white pages NM- $85 Make An Offer! Nice square copy, deep inks, offwhite pages VF/NM $75 Make An Offer! Square copy, offwhite pages VF/NM $40 Make An Offer! 3/4' spine split, offwhite pages F $15 Make An Offer! Offwhite/white pages VG+ $8 Make An Offer! DC version - 1975, offwhite pages VG+ $7 Make An Offer! Offwhite pages, water stain top of book VG $6 Make An Offer! White pages, distributor spray top right front/back cover NM-/NM $30 Make An Offer! Cream/offwhite pages, centerfold detached at bottom staple CGC 7.5 VF- $35 Make An Offer! Offwhite pages, small H written on top of front cover VF+ $1,500 Make An Offer! Cream/offwhite pages, rich colors CGC 6.0 F $53,500 Make An Offer! Off-white/white pages, light 6 written on front cover CGC 5.5 F- $45,000 Make An Offer! Offwhite/white pages, top 1/3 of cover torn off. Scan will be posted when book comes in from CGC This is how returns used to be done. 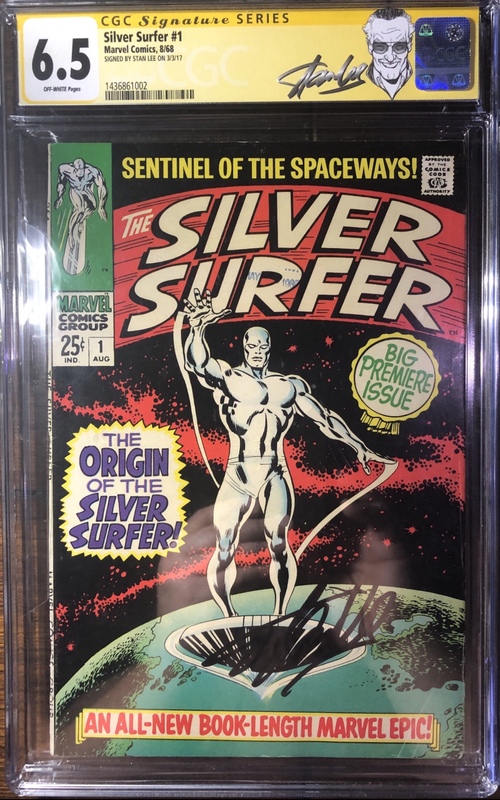 CGC 0.5 Pr $4,500 Make An Offer! Offwhite pages F- $425 Make An Offer! Offwhite/white pages CBCS 4.0 VG $525 Make An Offer! Offwhite pages VG- $600 Make An Offer! Cream/offwhite pages, JAN 22 R stamped on front cover, 1/4 inch tear through top bc and 8 pages VG $240 Make An Offer! Cream pages CGC 6.5 F+ $10,000 Make An Offer! Cream/offwhite pages CGC 6.0 F $9,500 Make An Offer! Offwhite/white pages, MOO 28-39 written on top of front cover in pen CGC 7.0 F/VF $650 Make An Offer! Offwhite pages CGC 8.5 VF+ $900 Make An Offer! offwhite pages VF/NM $1,225 Make An Offer! Offwhite/white pages, D9/27 written on front cover, sweet copy VF+ $975 Make An Offer! Offwhite/white pages, c1 13 11 written on front cover in grease pencil F $150 Make An Offer! White pages F $145 Make An Offer! Offwhite pages, cover detached from bottom staple, C616 written on front cover in grease pencil VG/F $140 Make An Offer! offwhite pages, colors faded from being stored in basement with a oil furnace VF $775 Make An Offer! Cream/offwhite pages CGC 7.5 VF- $1,800 Make An Offer! White pages, C9/26/ written on front cover VF- $360 Make An Offer! Offwhite pages, original owner collection F/F+ $195 Make An Offer! Yes the colors are that rich! offwhite pages, the tiniest of dents in the lower right corner keep this from grading higher VF/VF+ $625 Make An Offer! White pages F+ $165 Make An Offer! White pages, C 6 5 11 written on front cover in grease pencil CGC 8.0 VF $225 Make An Offer! Offwhite/white pages, JUL 31 1962 stamped on back cover VG $50 Make An Offer! Offwhite pages, original owner collection VG/F $35 Make An Offer! Offwhite/white pages, C11/28 written on front cover in grease pencil VF- $80 Make An Offer! Offwhite pages F $120 Make An Offer! White pages, C 9 125 written on front cover in grease pencil VF+ $125 Make An Offer! Offwhite pages, tiny 7 28 written on front cover in pen VG+ $20 Make An Offer! White pages F $35 Make An Offer! Offwhite/white pages, 10D stamped on front cover F $75 Make An Offer! VG+ $55 Make An Offer! Offwhite pages, 5.00 written on top of splash page F+ $70 Make An Offer! Offwhite pages F $66 Make An Offer! Mohawk Valley $60 Make An Offer! Qualified, cream/offwhite pages, cover detached from bottom staple only CGC 9.4 NM $150 Make An Offer! Offwhite pages, Small C written on front cover in pen VF/VF+ $125 Make An Offer! Offwhite pages F/VF $65 Make An Offer! Offwhite pages F+ $65 Make An Offer! Diamond Run $260 Make An Offer! Offwhite pages CGC 8.5 VF+ $225 Make An Offer! White pages CGC 8.5 VF+ $225 Make An Offer! cream/offwhite pages, 3m written on cover in pen, centerfold detached from bottom staple only CGC 9.2 NM- $200 Make An Offer! offwhite pages VF $75 Make An Offer! White pages VF $65 Make An Offer! Original owner collection, offwhite pages F/F+ $40 Make An Offer! Original owner collection, cream/offwhite pages, tiny tiny piece out of top bc F- $18 Make An Offer! offwhite pages, very nice copy NM- $125 Make An Offer! Original owner collection, cream/offwhite pages VF- $38 Make An Offer! Offwhite pages, MAY 22 PM stamped on back cover VF- $28 Make An Offer! White pages. 1.5 inch tear in front cover VG/F $12 Make An Offer! Offwhite pages NM- $225 Make An Offer! Offwhite pages VF/NM $200 Make An Offer! White pages, water damage, extra staples G $7 Make An Offer! cream/offwhite pages CGC 9.2 NM- $140 Make An Offer! F+ $20 Make An Offer! VG+ $6 Make An Offer! VF+ $18 Make An Offer! Offwhite pages, Marshall Mich 5/29/55 written on front cover, cover detached from bottom staple VG $10 Make An Offer! Restored - B-1, small amount of color touch. Stan lee signature on 1st page in marker, offwhite/white pages CGC 8.5 VF+ $750 Make An Offer! Offwhite pages VF/NM $225 Make An Offer! Offwhite pages, small C written on back of front cover F- $60 Make An Offer! offwhite pages VG+ $42 Make An Offer! White pages VF- $80 Make An Offer! Offwhite/white pages CGC 9.2 NM- $325 Make An Offer! Offwhite/white pages CGC 9.0 VF/NM $195 Make An Offer! Cream/offwhite pages, nice copy VF $75 Make An Offer! Offwhite pages, 1' bottom spine split, small C written on front cover in grease pencil G+ $20 Make An Offer! White pages CGC 9.4 NM $850 Make An Offer! White pages CGC 9.0 VF/NM $285 Make An Offer! OffWhite/white pages, date stamp on front cover CGC 9.0 VF/NM $225 Make An Offer! Offwhite/white pages VF $95 Make An Offer! Offwhite pages F+ $48 Make An Offer! Subscription crease, white pages VG/F $30 Make An Offer! Offwhite pages, small C written on front cover in grease pencil F+ $38 Make An Offer! Subscription crease, white pages VG/F $25 Make An Offer! Offwhite/white pages NM- $250 Make An Offer! Offwhite/white pages, APR 13 stamped on front cover NM- $250 Make An Offer! Offwhite pages, tiny NS written in upper left corner of front cover VF/NM $160 Make An Offer! White pages VF+ $140 Make An Offer! Cream/Offwhite pages F- $28 Make An Offer! Offwhite/white pages F+ $35 Make An Offer! Offwhite/White pages, rust bottom staple, water stain back cover F $35 Make An Offer! Offwhite/White pages CGC 7.0 F/VF $50 Make An Offer! Offwhite/white pages, small C written on front cover in grease pencil F+ $35 Make An Offer! Offwhite pages, small C written on front cover in grease pencil F+ $35 Make An Offer! Offwhite/white pages, NOV 13 stamped on front cover F/F+ $30 Make An Offer! Offwhite/white pages NM- $425 Make An Offer! Offwhite pages VG/F $40 Make An Offer! Offwhite/white pages, small Name/address stamp on bottom of splash page VF/NM $200 Make An Offer! Offwhite/White pages, 2 distributor marks top of book VF+ $125 Make An Offer! Offwhite/white pages, cover detached from bottom staple F- $25 Make An Offer! Offwhite pages, APR 14 stamped on back cover VF- $45 Make An Offer! White pages VF/NM $200 Make An Offer! White pages CGC 9.8 NM/M $500 Make An Offer! White pages CBCS 9.6 NM+ $175 Make An Offer! White pages CGC 9.4 NM $55 Make An Offer! White pages CGC 8.0 VF $100 Make An Offer! Offwhite/white pages NM-/NM $30 Make An Offer! Offwhite pages, Major moisture rippling G $2 Make An Offer! White pages CBCS 9.8 NM/M $55 Make An Offer! Original owner collection, offwhite pages NM $6 Make An Offer! Original owner collection, offwhite pages VF/NM $3 Make An Offer! Original owner collection, white pages NM $6 Make An Offer!